The aircraft inlet and nozzle bring airflow into and out of the gas turbine propulsion system. The performance of the inlet and nozzle depend on both the flight conditions of the aircraft and the operation of the turbine engine. Special wind tunnel models are used to determine the performance of the inlet inlet and the nozzle. On this page we show two examples of nozzle performance wind tunnel models. 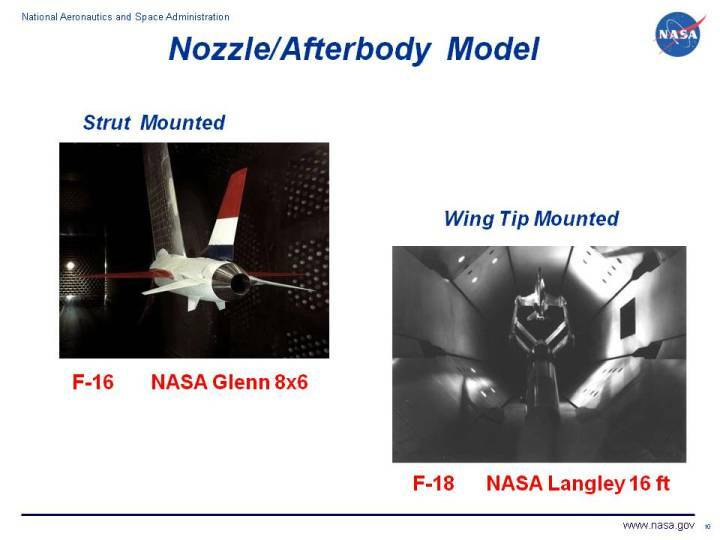 The model on the left is an F-16 nozzle model mounted in the NASA Glenn 8x6 foot transonic tunnel. The model on the right is an F-18 twin-nozzle model mounted in the NASA Langley 16 foot transonic tunnel. There are several features that are unique to nozzle/afterbody wind tunnel models. To properly model the flow exiting the nozzle, high-pressure gas must be brought into the model and discharged through the nozzle. On some models, the aerodynamic effects of the changing nozzle pressure ratio on afterbody drag is measured by putting some portion of the afterbody model on a balance. Propulsion systems for fighter aircraft like the F-16 and F-18 usually employ afterburning to produce additional thrust. During afterburning operation, the nozzle area must be increased in order to pass the engine mass flow rate at the higher temperatures in the nozzle. The nozzle/afterbody wind tunnel model must therefore employ several nozzles with different external areas to correctly simulate the geometry of the aircraft. The nozzle on the F-16 model in the figure is the configuration used in military power, without afterburner operation. An additonal nozzle model is required for the full afterburner configuration. Some modern fighter aircraft use vectored thrust to increase aircraft performance. The thrust vector is varied by changing the shape of the nozzle in flight. Again, the various configurations must be wind tunnel tested to determine performance.